Peanut butter and chocolate, how can you go wrong? And when it doesn't involve heating up an oven, hot mitts and cooling racks, it really is a win-win for everyone involved. The calories are simply not an important factor here. The other day I was thinking to myself about how I love baking even if I give most of my goodies away, it is just fun to go through the process in making it. I think it is because I love the challenge. I love proving that gluten-free baked goods can be just as good, if not better than their gluten-filled doppelgangers. I had a friend announce the other day, whose wife is gluten-free, that gluten-free baked goods are horrible tasting, dense and dry. I couldn't believe it...well, yes, I could believe it, but he obviously hasn't really gotten "out there" in the gluten-free world. Sure, if you grab a random box of gluten-free cookies off the grocery store shelf, you are very likely to be disappointed and discouraged with what the gluten-free world holds. Once you start baking at home, you will be amazed at how you don't miss the gluten. 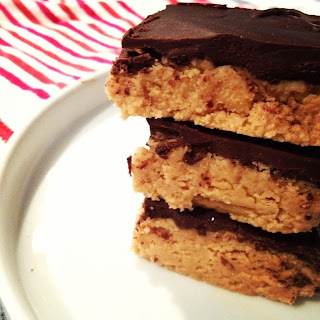 I was craving making something easy that included peanut butter, and I thought chocolate peanut butter bars would fit the bill. Most versions of this recipe include cookie crumbs, but I did not let that stop me. I used crumbled Vanilla Chex instead. Really, any kind of Chex, or gluten-free cookie will do. Remove from baking dish and cut into squares. Store uneaten bars in the fridge. It's a homemade peanut butter cup......only better! YUM!! I think I need to make these for the weekend.